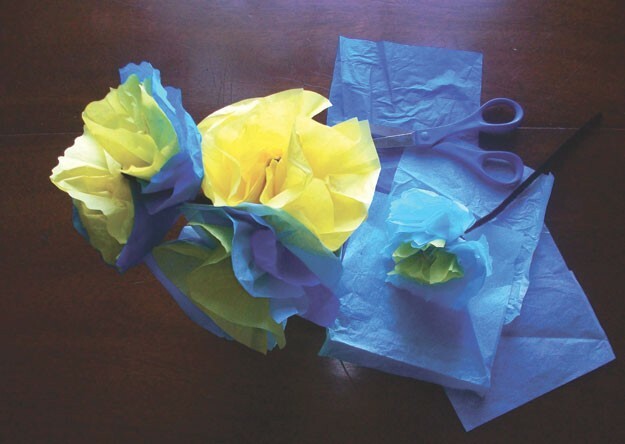 Tissue-Paper Flowers | Project | Kids VT - small people, big ideas! Spring is just around the corner — though it's pretty hard to tell in Vermont. Don't let mud season get you down. Brighten up with a bouquet of these simple tissue-paper flowers, perfect for a child's nightstand, a dinner-table centerpiece or even an office shelf. You can customize them by alternating hues, zigzagging the edges or changing the size. Better still: No watering necessary. These petals will last until your real garden is in full bloom. 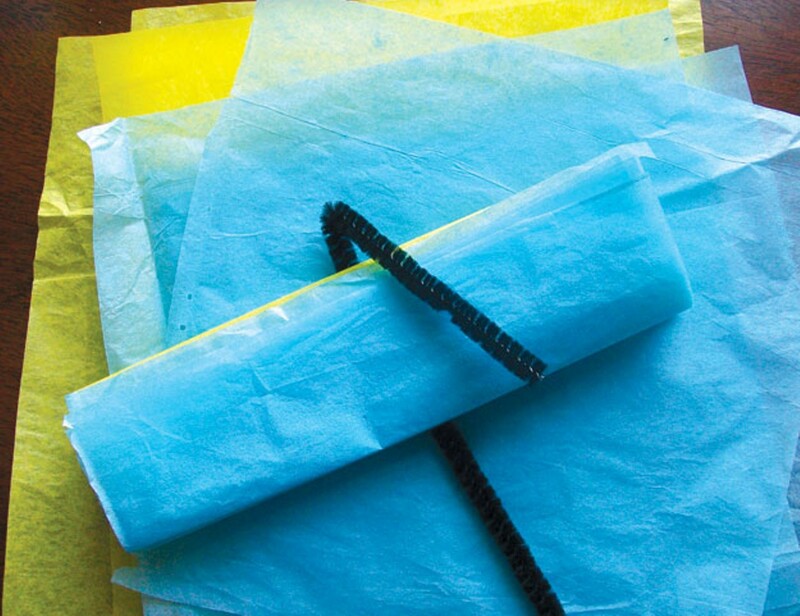 Cut at least four sheets of tissue paper into squares of the same size. The larger the sheets, the larger the flowers. We cut ours into 6-by-6-inch squares. Straighten the sheets into a neat stack. Fold the stack like an accordion — first to one side, then the other — all the way across. We made roughly 1/2-inch folds. Make sure the folds are even. Attach the flower's stem by looping a pipe cleaner tightly around the center of the folded accordion and twisting the loop closed. With the accordion stack and stem held like a T, gently separate each sheet of tissue paper and pull it upward. Fluff as necessary to make your flower look full. Repeat steps 1 through 5 until you have a bouquet. You can change or alternate the colors of the tissue paper, cut sheets to different sizes, or add sheets for a fuller look. 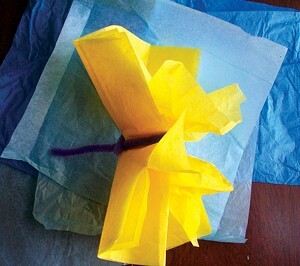 Get creative: Use scissors to round or zigzag the ends of the folded accordion to give your petals different shapes. Use different colors in your stacks to make a colorful bouquet. If you plan your folding, you can choose the colors for the center or outer petals of your flowers. Carolyn Fox is the calendar editor at Seven Days.